A perfect opportunity to make a difference where it is needed most, enabling you to leave a positive, lasting memory at the volunteer project you have chosen. You are not just here to make a difference, but also to experience a new culture, meeting new people whilst building lifelong friendships. What better way to see the world than to give something back to the communities you are staying with, learning new life skills that will benefit you and others in the future and leaving nothing but positive footprints behind during your travels. Responsible Travel is at the heart of our company, which is evident through our school development projects and conservation initiatives and we are passionate about minimising the negative aspects of foreign travel. We are based close to all of our volunteer placements, offering a 24/7 support system if needed during your time here. 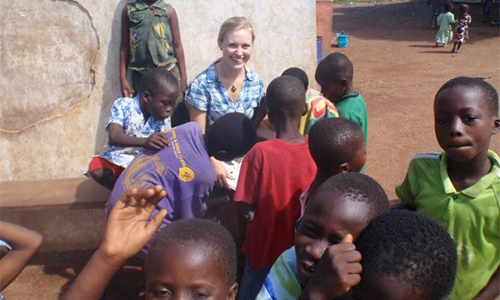 Our volunteer coordinators will keep in regular contact with you and the project, ensuring you both get the most from your time here in Ghana. 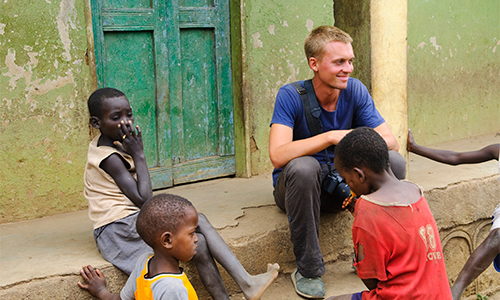 We offer volunteer placements in a wide range of areas that include Health, Schools, Orphanages and Sports, among others. One of the most important and worthwhile volunteer programmes you could choose to be involved in. Many children in Ghana are neglected, orphaned and in great need of love, care and affection to help them on the road to recovery. An opportunity to make a real lasting difference in the lives of many, you will be surprised by how much of an impact you can make in a short period of time. Compassion and a dedicated desire to improve the lives of the under-privileged children you will be working with is the only qualification you need. All durations can be catered for from one day to one year; contact us to make that perfect placement for you. Sport is a vitally important part of any young person’s development and Ashanti African Tours are leaders in volunteer sports programmes here in Ghana. 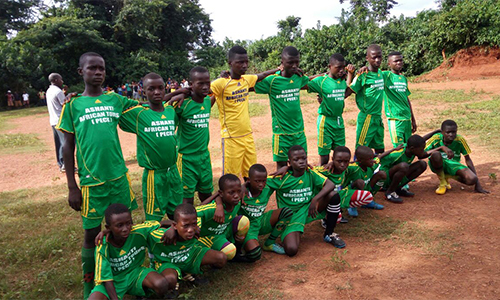 Two local football teams for both boys and girls are sponsored by us here in Ghana, one in a coastal community near Elmina, and the other in the Ashanti Region. Our volunteer sports programmes range from rugby, to athletics, basketball, football, baseball, volleyball, netball, cricket, cycling, table tennis and tennis. Sport has an amazing ability to bring people from different cultures and backgrounds closer together. Allow our team to make that perfect placement for you. We are all aware of how important education is for the future of children and the country as a whole; this is why we as a company have focused on building educational institutions as part of our responsible travel initiatives. 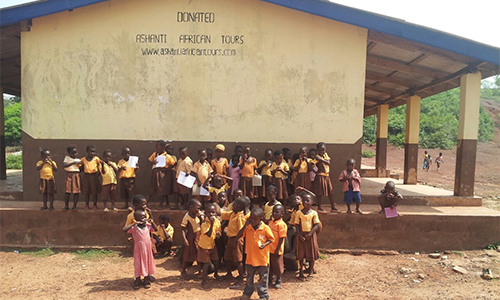 Ghana has a literacy rate of approximately 60%, with its schools desperately under-resourced and oversubscribed. Our teaching placements are extremely rewarding and you do not have to be a qualified teacher to make a real difference, all we ask for is a dedicated, focused attitude and good level of spoken and written English. Our volunteer teaching placements are set in different environments, which vary from government school classrooms to our own educational facilities and under shady trees in remote villages. Education should be the right of every child, not just the privileged few. Allow us to make that perfect placement for you. Special needs education can be very challenging, but also very rewarding. This is an area in Ghana that has very little investment, is highly under-resourced and has few facilities and trained professionals. Patience, compassion and a real desire to make your time here productive are the main qualities you need when working with special needs students. There are many children and adults not reaching their full potential due to the lack of support offered here. Join one of our special needs voluntary teaching programmes and help many children and young adults make that successful transition to reaching their full potential in education and the workplace. 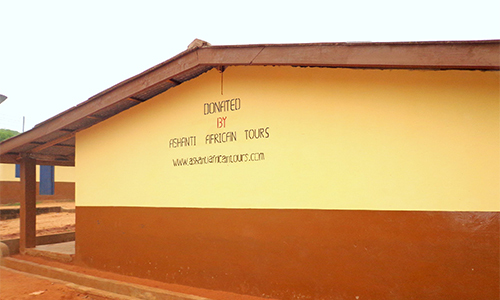 To see detailed information on our current school project, where we are building an eleven-classroom school facility in the Ashanti Region and are also protecting endangered bird and mammal species and an area of rainforest, please click on the PECK Info link. We understand the importance of safety, especially when working with volunteers and this is our main priority when operating programmes. When travelling to Ghana, it is important to book with a local tour company that has the legally-required insurance policies and operating licences, as your international travel insurance will be invalid if they haven’t. Ghana is an emerging economy and the resources are not available to check and identify the many bogus travel companies which have developed websites and operate illegally here. The cheapest option is not always the best option, as there are reasons for companies offering cheaper packages and these are usually due to them not operating within the laws of the land. It is estimated that over half of local tour operators offering placements here in Ghana do not have professional indemnity and public liability insurance, use vehicles that are not comprehensively insured and do not have a Ghana Tourism Authority operating license, and as they are not registered do not pay taxes which ultimately has a negative effect on Ghana’s development and ability to direct funds into the very areas you have come to volunteer in.